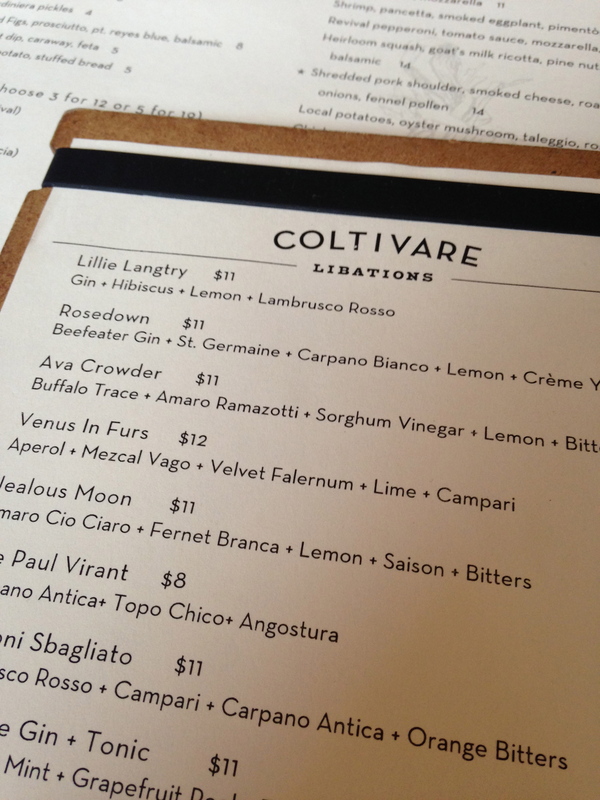 Coltivare–Pig Parts and Putrefaction Never Tasted So Good. Down White Oak from Revival Market in the Houston Heights waits a trattoria-style dining experience combining fresh, local produce and engaging, delicious cooking–Coltivare. Mr. and Mrs. MagicFishBones arrive at six, greet another couple, and fortunately are able to sit immediately at one of the last available tables–right near the front window. Going out to dinner with friends has its own etiquette, different from having them over to the house, which includes ditching children, arriving together, putting cellphones away, and laughing–lots of laughing, near hysterical. The ambiance at Coltivare exudes thoughtful, rustic dining with plenty of dark wood, natural light and wine bottles filling the walls around us. Just the type of place to make a fantastic discovery, and the menu does not disappoint. The lean meat of which mortadella is composed–the shoulder and neck from carefully selected hogs– together with the jowl and other parts of the pig that the traditional formula requires, is, in fact, ground to a creamy consistency before it is studded with half-inch cubes of fine hogback mixed with a blend of spices and condiments that varies from producer to producer, and stuffed into the casing. And then a pork terrine–I love a loaf of forcemeat. What to choose? 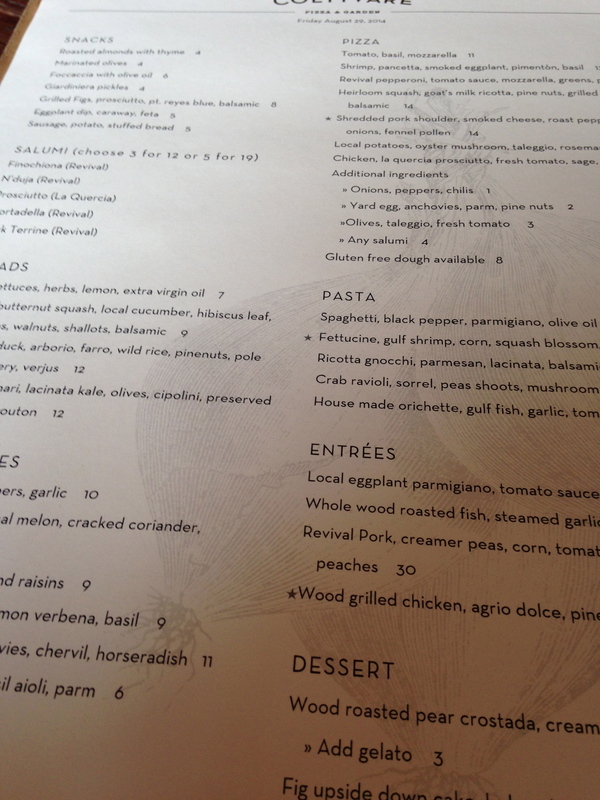 We go for the Finochiona, Prosciutto and Mortadella–3 for 12 dollars. Time to take a look at the cocktail menu. 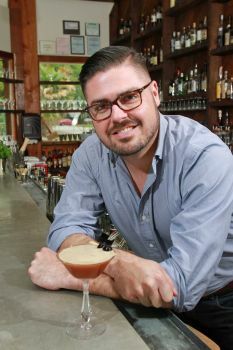 Take a look at the Ava Crowder: Buffalo Trace Bourbon (very smooth), Amaro Ramazotti (an Italian bitter), Sorghum Vinegar (brewed from sweet sorghum which has a high sugar content), lemon, and bitters. Here is co-owner Morgan Weber with the beautiful concoction. Of course, I order it, and now we move onto the wine for the night. Our friends mention their love of malbec and the waiter points out the Lamadrid Single Vineyard Gran Reserva Agrelo 2010. It has a high ranking for wine region and country, so order we do. Wait a minute, you might say, is Mr. MagicFishBones going to have his cocktail and wine at the same time? 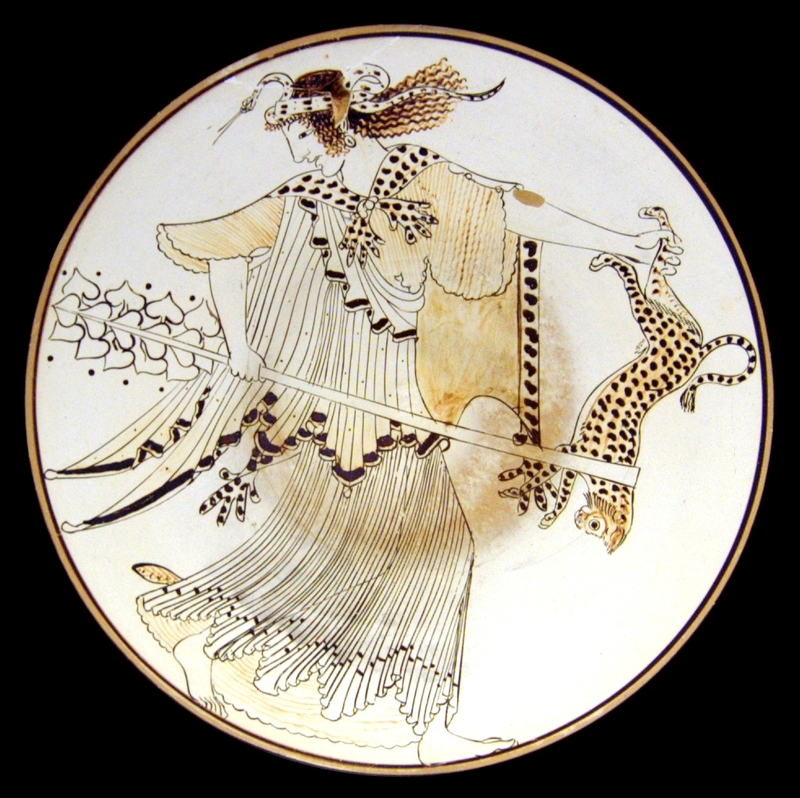 Doesn’t courting Dionysus lead to wearing snakes and ripping apart animals? Yes, yes it does. The salumi arrives served with bread and the mortadella is to die for–so creamy, meaty with all the pig parts intact. The Ava Crowder has a dark, bubbly sweetness which I down rather quickly. Agrelo is a small wine–producing village in the western foothills of the Andes mountains and the wine offers a dark, earthy taste with currants, and vanilla from spending months in French oak. As for the conversation? Beginning of the academic year, happiness at changing jobs, keeping jobs, staying at home, Labor Day, good food, fourteen year-old boys wearing suits to school, living in the Heights and general loudness. Let’s order our main courses. 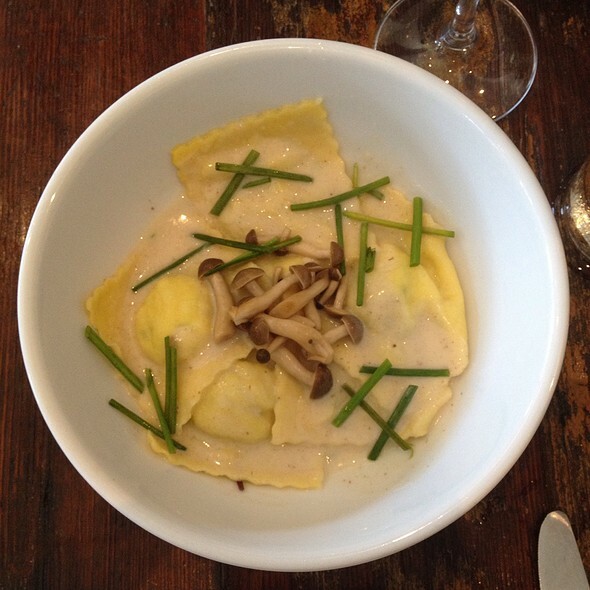 Mrs. MagicFishBones orders the crab ravioli, featuring house made ravioli, sorrel, pea shoots and long-stem mushrooms. She loves the mushroom sauce and pasta, but can’t really taste the crab. 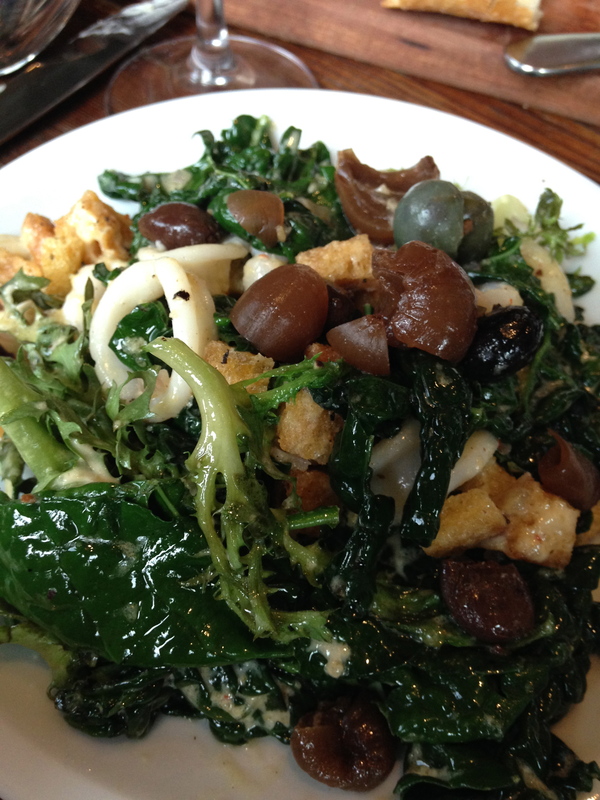 Mr. MagicFishbones orders the calamari and kale salad with olives, cipolini, in a wonderful lemon sauce. This dish really comes alive on the tastebuds, with the warm kale and sautéed calamari and a refreshing lemony brightness all around. 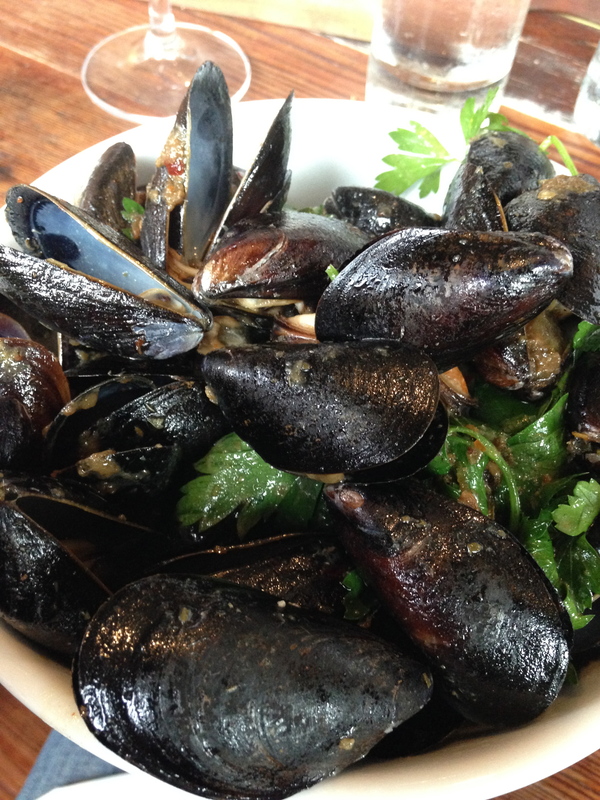 I also order the mussels with garum, capers, and garlic. Garum? Why yes, “one of the defining flavors of the ancient world,” so writes Harold McGee in On Food and Cooking. Beautiful. 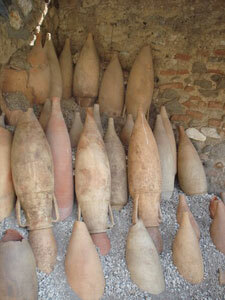 Here are many amphora in a garum shop at Pompeii. Let’s thank the archaeological gifts provided by volcanoes. This sauce goes further back to the Aegean Islands in the fifth century BCE. Athenaeus in his The Learned Banqueters (end of the second century CE) offers this delightful exclamation, supposedly appearing in Plato’s works: “They’re going to choke me to death by dipping me in rotten fish-sauce.” All I can say is dip away, I find this a brilliant dish endowed with a salty, anchovy-like cause coating the mussels with capers upping the salt and earthiness, and the garlic adding a different bite. The salad and starter together with two bottles of malbec make for a great meal and conversation. Another fantastic dining moment in the Heights. We’ll be back! Previous Previous post: Why A Food Blog? Roux And A Symposium . . . Or How I Dance, Talk, And Brown Butter At The Same Time.